Macchiato v/s Cappucino v/s Latte v/s Mocha - What's the Difference? Coffee drinking is a daily pampering ritual that is not only pleasurable, but it also brings a handful of health benefits. Did you know that statistics indicate that four cups of coffee a day reduce the odds of suffering from type 2 diabetes by 50 percent? Plus, it boosts your metabolism. As you can see, coffee is good for you. In fact, life without coffee is scary. And every one of us loves experimenting with different coffee assortments, right? Still, unless you’re a skilled barista, the odds are that you can’t differentiate between distinct espresso-based drinks. Navigating the menu at your favorite coffee shop doesn’t have to be a challenge. In today’s post, I will present to you the main characteristics of distinct coffees. Each of these espresso based drinks, namely the cappuccino, the latte, the macchiato, and the mocha are unique. So, coffee aficionados (or fanatics) like you and I should tell the difference. That being said, check the table below to see the main differences between the four beverages we’ll discuss today. Cappuccino v/s Latte v/s Macchiato v/s Mocha - What's the Difference? As you can see, each of the featured beverages includes espresso. Although the components correspond, the ratio for each beverage differs. To begin with, the modern-day cappuccino has developed from the Austrian coffee beverage referred to as kapuziner. It encompasses three ingredients: espresso, steamed milk, and milk froth. In essence, a cappuccino is prepared following a 1:1:1 ratio of these components. In truth, the fundamental difference that distinguishes a cappuccino from a latte is the proportion of the ingredients. As you can see in the table above, the ingredients are the same. 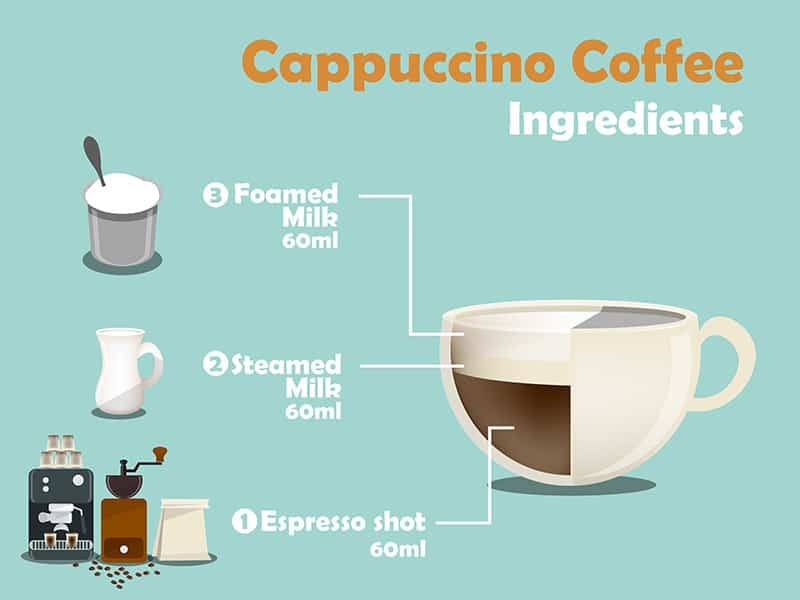 How do you prepare a mouth-watering cappuccino? First and foremost, the foundation of this beverage is espresso. Afterward, you pour hot steamed milk from the jug. You should pay attention to withholding the froth. As soon as you have poured the correct ratio of milk, the froth is the cherry on top. A cappuccino is a stronger beverage than a latte because of the presence of the milk foam over the milk itself. Apart from that, the flavor of the espresso is rich and strong, lying in the wait under a stretched, smooth layer of thick foam. Extra tip: while preparing your cappuccino, you should use a spoon for holding back the stiff froth while pouring the steamed milk. Immediately afterward, the froth is released. Ideally, you should distinguish between three different layers: espresso, steamed milk, and froth. Distinct from the 1:1:1 ratio used in the making of a cappuccino, a latte’s ingredient ratio is: 1:4:1. The smooth, silky foam is, probably, the element that makes the latte very tempting (to me, at the very least). The truth is that the texture of a latte’s foam is crucial as it gives the beverage a distinct taste and appearance. More or less often, you’ll notice latte art on top of the beverage. That is accomplished by pouring the milk in a certain way. Considering the significant presence of steamed milk, a latte isn’t a strong beverage. In fact, it is quite mild, being a popular addition to breakfasts in France and Italy. Drinking a latte feels like drinking milky coffee while enjoying a cappuccino feels like drinking stiff foam with a layer of coffee hidden at the very bottom. The coffee flavor is a bit subtle, and the creamy consistency is to die for. 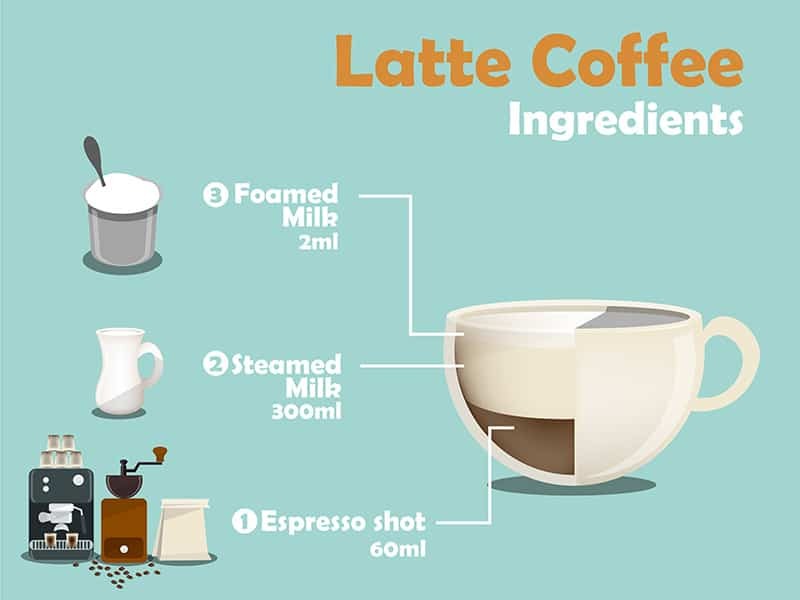 So how do you prepare a typical latte? Optionally, you could challenge your hidden talent to create latte art. It’s just a matter of time until you start to master the technique if you’re eager to practice. The macchiato has some things in common with the popular latte – they both contain milk; still, the ratios differ. In truth, a traditional macchiato embodies a shot of espresso, which is finished with milk froth. The English translation for the Italian macchiato is stained milk. This implies that the milk is stained by the overwhelming presence of the espresso. The term stained highlights that the quantity of milk is just enough as to alter the original color of the espresso. Caffe macchiato is also referred to as espresso macchiato. It is featured by a bold flavor, in comparison with other caffeine beverages. That’s because it encompasses a small amount of milk combined with espresso. Simply put: a macchiato is an espresso with a bit of milk in it. 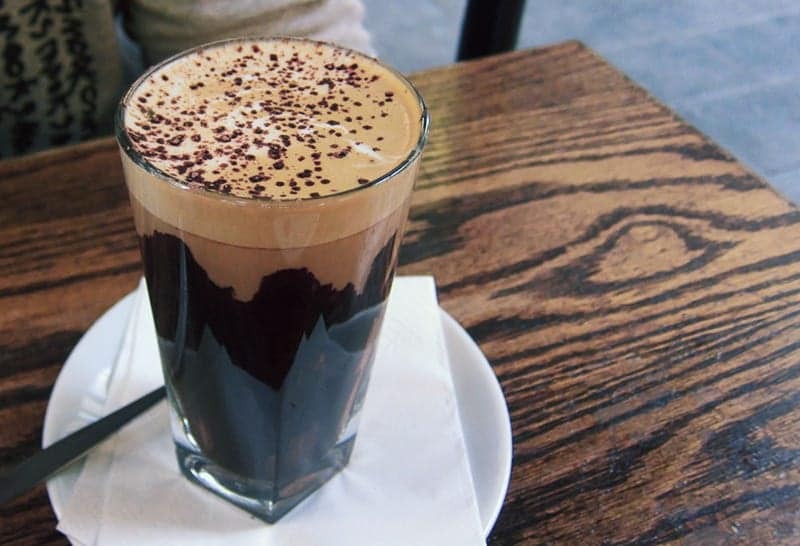 In Portugal, this drink is referred to as café pingado or coffee with a drop. I would wholeheartedly recommend this beverage to you if you like drinking strongly flavored coffee (I definitely fit into this category). You can choose from a short or long macchiato. So, if you’re not a big fan of the strength of a typical espresso drink, both a short or long macchiato could be down your alley, as the milk genuinely alters the taste of the beverage, without affecting it too much. 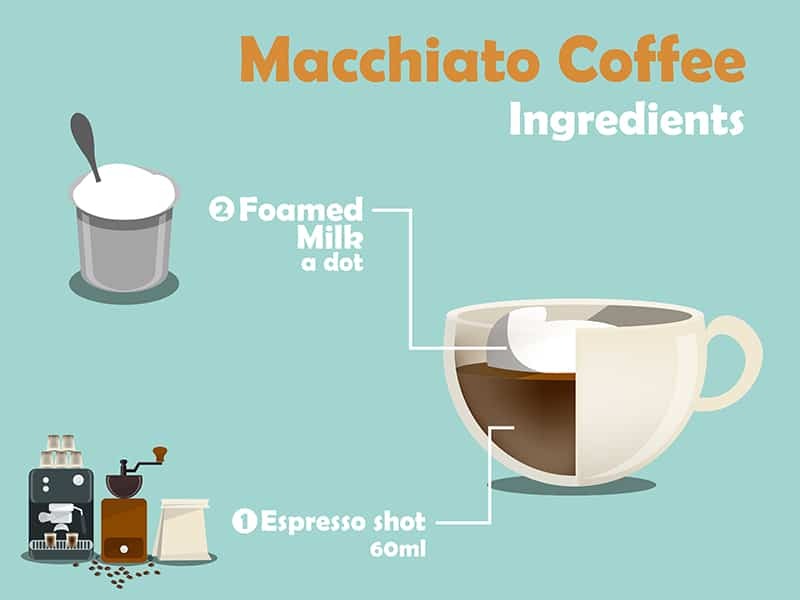 So, how do you prepare a typical espresso macchiato? Pro Tip: If you’re a fan of strong coffee beverages, you could use two espresso shots to maximize the flavor. The key to preparing the perfect macchiato is to add the espresso first and the milk second. This way, the espresso is marked by milk. This small detail differentiates the macchiato from other beverages. And lastly, the mocha incorporates a wonderful blend of ingredients that is bound to pamper your taste buds. It’s the kind of beverage that seems to be similar to a dessert. Mocha, also known as Caffee Mocha or Mochaccino is the delight of every chocolate lover. The beverage incorporates espresso, hot milk, and chocolate, being similar, to some extent, to a latte. Still, what makes this drink truly unique is the addition of chocolate to the combination. However, whether you like this beverage or not, is a subjective matter. Many coffee enthusiasts aren’t too keen on coffee/chocolate/caramel/vanilla combinations. Still, our tastes aren’t discussable, right? Some cafes prepare their own syrups for their mochas. Others use chocolate syrup or, alternatively, break up pieces of chocolate. Also, some mocha beverages are served with foam or whipped cream. Optionally, baristas add a dust of cocoa powder or cinnamon. Some people prefer to drink their mochas with marshmallows, which makes the beverage similar to hot chocolate. Chocolate and coffee have been mixed for centuries. Their flavors complement one another, which is the primary reason why one can choose from various chocolate/coffee desserts, as well. 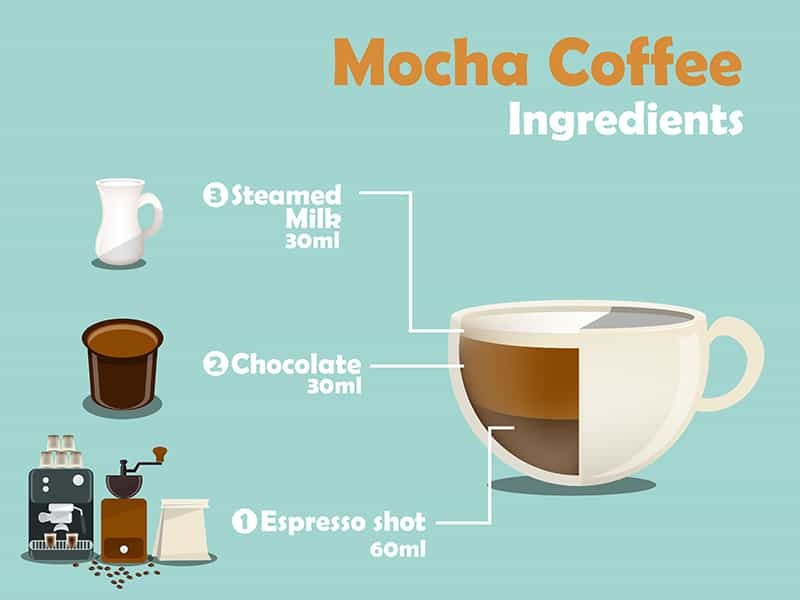 How do you prepare a typical mocha? Place 2 oz. of chocolate on the bottom of a glass. Incorporate the milk, as you stir gently. Make sure you save the froth last. Next, pour in the espresso shots, and add the milk froth. Alternatively, you could add cold cream on the top; sprinkle a bit of cinnamon, grounded coffee beans or grounded coffee on top. Of course, when it comes to flavors, the possibilities are endless, and you can use your imagination. Considering that espresso is the constant in each of these beverages, what makes the difference is the milk. Many people undermine the importance of milk in preparing excellent coffee. Most espresso-based beverages include frothed, steamed or cold milk. While it could appear insignificant, using the correct type of milk could make the world of a difference. Milk’s density differs, which affects the texture and volume ratio. In order to obtain frothed or steamed milk, you should use a special milk frother or the steam wand of your espresso machine. The frothing device should blow steam into the milk. While it heats it, it incorporates air into it as well, which gives it a puffy consistency. Pro Tip: Full-cream milk is often preferred by baristas. Since it has more fat, it is more elastic. The fat proteins present in full cream milk create a lovely latte texture we all love. Although every type of milk could be textured, low-fat or soy milk could cause latte splitting. The primary distinction between various types of foamed milk is the amount of bubbles. In the case of frothed milk, the volume is doubled. As for steamed milk, the volume increases by a third only. 1. If you wish to prepare steamed milk, you have to place the steam wand in the milk, at approximately 1 inch in. Make sure you put it at the right angle so that the steam creates a vortex. As soon as the milk has the right temperature – 145 to 155 Fahrenheit degrees, cease steaming. 2. Frothing milk is pretty much the same. The wand should also create a vortex. As you notice the milk getting foamed on the surface, you should place it deeper, until you get to the bottom of the cup. Make sure you do that gradually. Also, don’t steam too long in one place. As soon as you notice that the froth has developed and the volume has grown, you should go further. The effect of the milk in a coffee beverage is substantial. That’s because it dilutes the aroma of the espresso, altering it, more or less. Pro Tip: The secret to frothing milk like a pro is to keep the steam want right on the surface of the milk. The primary distinction between drinks appears when the steaming is done, and it’s high time to pour the drink. Baristas like to swirl the milk around to create a pitcher of velvet micro-foam. What about pouring the milk? Pouring the milk is also conveyed as an art. I would advise you to use a spoon to hold back the foam. You should fill the cup depending on the amount needed for your drink; add the espresso, and spoon some frothed milk on top. Typically, coffee beverages should be immediately consumable. In the case in which it’s too cold, the milk flavor will be predominant. However, if it’s too hot, it could be bitter and cause that tingling sensation on your tongue. Bitter coffee results due to overheated milk, so make sure you avoid that. Coffee is a realm I never grow tired of exploring. It is unexpected and delicious. Even though it might not seem like it, the differences in taste between the four beverages – cappuccino, latte, macchiato, and mocha – are notable. So, it’s important to try different drinks and experiment with various beverages to establish what fits down your alley. To purpose of drinking coffee is to express your tastes and preferences. This minimizes the importance of the technical name of a beverage. Still, knowing to tell the difference does matter to coffee fans, doesn’t it? So, what would you like to enjoy next? A frothy treat, a.k.a. a cappuccino, a sharp beverage, a.k.a. the espresso macchiato, or a milky, frothy sensation, a.k.a. the latte? It’s up for you to decide. If you have other questions or thoughts on the subjects, you can write them in the comment section.